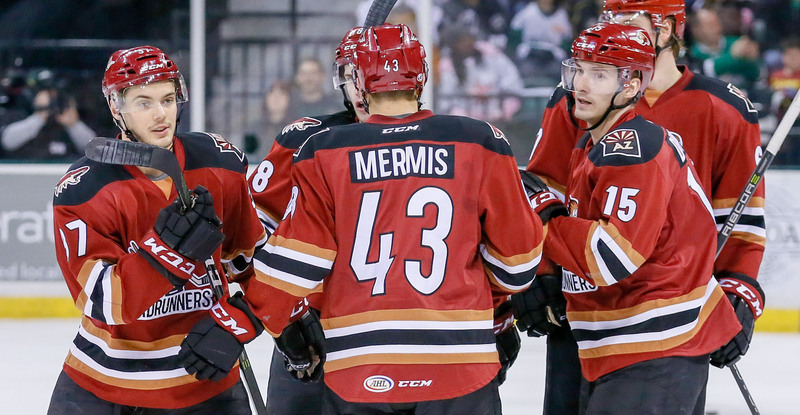 The Roadrunners downed the Texas Stars by a 5-2 score Friday night at the H-E-B Center, taking the first of four meetings between the two clubs this season. Five goals will do it most nights, but the Roadrunners’ win, their 26th of the season and 15th on the road, was built on blocked shots and tight defensive coverage. Hunter Miska, facing the only rookie goaltender, Landon Bow, with more wins than him this season, was the beneficiary of a defense that honed in on lane deprivation and tight neutral zone gaps to keep the Stars’ offensive attack in check. The Stars would be, however, the first team to score Friday night – Greg Rallo giving Texas a 1-0 lead just over a minute into the contest. Just over five minutes later, and in receiving a Lane Pederson feed while in motion atop the point, Dysin Mayo wristed a shot that caromed off of a Stars defenseman and past Texas’ Landon Bow to tie the game 1-1. In the final moments of the opening frame, Tyler Gaudet, positioned on top of the Stars’ crease as Joel Hanley fired a shot low on net, jammed home the rebound to give the Roadrunners a 2-1 lead. Gaudet’s goal, his 10th of the season, crossed the goal line with 0.1 seconds left on the clock. In the second period, Laurent Dauphin scored a pair of power play goals in a :52 second span to up the Roadrunners’ lead to 4-1, one of the game's bigger - if not biggest - turning points. The Roadrunners held the Stars to just a combined eight shots through the first two periods. Texas responded with a goal 2:48 into the third to make it 4-2. Lane Pederson scored an empty-net goal with 1:57 left to play to secure the Roadrunners 5-2 victory, the franchise’s first ever win at the H-E-B Center. Both Lane Pederson (1G, 2A) and Laurent Dauphin (2G, 1A) finished the night with three points apiece. For Pederson, it was the first multi-point game of his career. 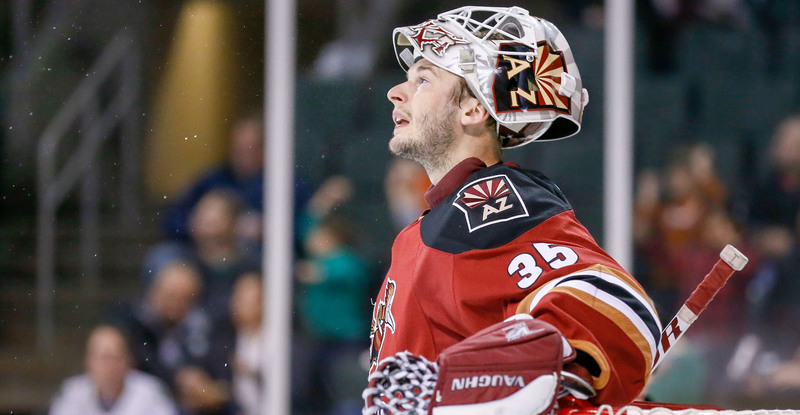 Hunter Miska stopped 16 of the 18 shots he faced, and is now 15-4-0 on the season. He has won eight of his last nine decisions. The Roadrunners are now 3-1-0-0 on their current six-game road trip, and are 15-4-1-1 in their 21 games played in opposing buildings this season. With an overall record of 26-14-2-1, which calculates in at a .640 win percentage, the Roadrunners continue to sit atop the Pacific Division in first place. The team continues its trip Saturday night when they take on the Texas Stars again at the H-E-B Center, where the puck is scheduled to drop just after 6:00 PM MST.